BimmerWorld/C&R Racing E46 M3 Oil Cooler BMW - Brakeswap.com - Friction for the Win! Even in stock trim, the oil on the E46 M3 gets hot. Add additional horsepower and stress on the engine, run it around the track for 10 minutes straight, and the oil gets very hot. Even the best synthetics should be kept under 250 degrees if possible and never above 300 degrees, and on this car, the stock cooler just will not get the job done. Capacity – Yes, Bimmerworld has doubled the cooler capacity, but capacity isn’t the key to cooler oil. It helps, but this is a minor point. Counterflow Two-Pass Design – The stock E46 M3 oil cooler is a good design – a long, cooler under the radiator. Oil flows from one end to the other and gets cooler as it goes. The best way to add capacity is to add more length, but we only have as much room to work with as the factory provides, and the same goes for the next best option – height. Unfortunately, every two-pass cooler currently on the market divides the height (and efficiency) in two, send the oil across the top and then returning it on the bottom (or vice-versa). The worst way to attempt to get more cooling is to add depth – this adds capacity but the thermal efficiency greatly decreases as the air flows through the cooler, heating up along the way. What’s left? By stacking coolers front to back, we can strategically cool the oil in stages, achieving almost double the effect of the factory (or even high-capacity aftermarket) design. Oil first flows through the back of the cooler through warmer air (warmed from the second pass), but still with a significant delta of air vs. oil temp. Then, the second cooling stage routes the oil through the front cooler, through the fresh, ambient air, again with a significant delta of air/oil temperature. Core – The casual observer sees a radiator or oil cooler as some sort of core that the air flows through with differences in end tanks and finishing – some competitors even polish their cooler to give an appearance of performance or quality. Unfortunately, polished coolers don’t win races and it is the insides that matter in the business-end of a performance oil cooler – the core. All cores are not the same. Due to the space constraints and extreme cooling demands of the S54 engine, we chose the best core available for this cooler, which has an aerodynamic tube design, spaced specifically to maximize cooling for this application and is fully furnace brazed with no epoxy. The tubes are extruded to withstand higher pressure which is extremely important for cold start up. Turbulators are located inside the tubes to agitate the oil as it passes through – air passes across the top and bottom contact surfaces of the tube and the oil flowing along the sides is cooled, but without these turbulators to stir and mix the surface flow with the rest of the oil, you are only cooling the oil on the surface and efficiency is not maximized. Mounting – This custom piece utilizes four mounting tabs and two bolts to secure directly and easily to your stock radiator’s mounting points. No fabrication or additional brackets required. Slight trimming for air duct fitment is required due to the additional size. 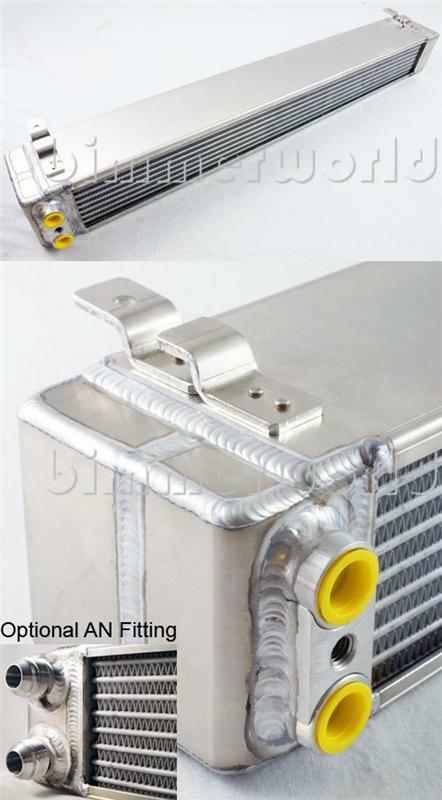 Plumbing – Bimmerworld offers this cooler with two plumbing options – either a direct-fit for your stock oil cooler hose (E46 specific) or a pair of -10AN fittings if you prefer to run braided stainless lines for additional abrasion protection. Size approximately 28.5”L x 3.5”H x 3.5”D. As with all C&R Racing products, this piece is manufactured completely in the USA and individually tested.